Donna Thorpe Bensenberg, formerly of Colona, died November 14 surrounded by her family. According to her wishes, there will be no visitation or funeral services; a private burial will take place at a later date. Memorials may be sent to your local fire department, Arrowhead Ranch in Coal Valley, or a charity of your choice. Donna was born in Moline on March 7, 1930, to Roy “Kirk” Thorpe and Mildred James Thorpe. 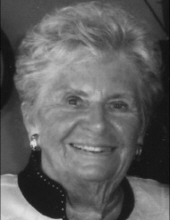 She attended schools in Erie, graduating in 1948. She graduated from Cornell College in Mt. Vernon, Iowa, in 1952, and taught in Davenport. On December 22, 1953, she married Harry L. Bensenberg in Moline. They farmed in the Colona area. Their children are Michelle Bensenberg and her husband Jimmy Robertson of Austin, Texas; Brad and Tina Bensenberg of Port Byron; and Lisa Rusk of Geneseo. Donna and Harry have four grandchildren: Austin and Alex Rusk, and Mitchell and Taylor Bensenberg. She is also survived by her brother, R.K. Thorpe III, of Englewood, Florida; five nieces; and Donna’s and Harry’s cousins. She was preceded in death by her husband Harry in 2005. Donna was involved in promoting the pork industry in schools, not only in Henry County but also statewide. She also was active in the Republican Party, being a past president of the Henry County Republican Women, and a past Vice-Chairman of the Henry County Central Committee. She especially enjoyed being involved in the activities of her children and grandchildren, and spending time with her friends. Her last years were enhanced by her friendships at Park Vista in East Moline. Donna’s family is grateful to her wonderful caregivers and dear friends for their love and support. To plant a tree in memory of Donna Bensenberg, please visit our Tribute Store. "Email Address" would like to share the life celebration of Donna Bensenberg. Click on the "link" to go to share a favorite memory or leave a condolence message for the family.